Beaconic iOS app live in de AppStore!Beaconic iOS app launched in AppStore! Beaconic for iOS has finally been approved by Apple for the AppStore today and is live in the store. 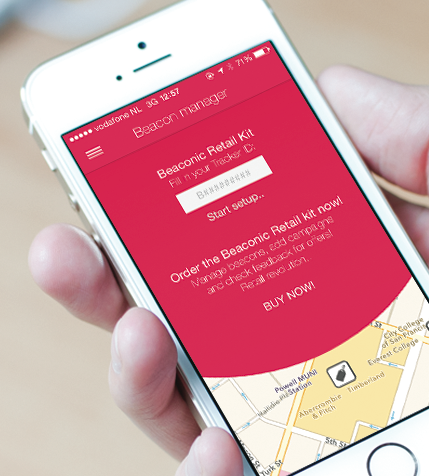 This application monitors for all iBeacons sold by Beaconic and offers Retail Kit owners to activate their beacons. With our Facebook integration offers or information from iBeacons is saved to your profile. Its also possible to monitor multiple beacons in one store of multiple stores. Our applications has been designed to never SPAM users with notifications. We have planned an update of the iOS app within 2 weeks and publication of our Android app within 4 weeks. Download app Beaconic for iOS has finally been approved by Apple for the AppStore today and is live in the store. This application monitors for all iBeacons sold by Beaconic and offers Retail Kit owners to activate their beacons. With our Facebook integration offers or information from iBeacons is saved to your profile. Its also possible to monitor multiple beacons in one store of multiple stores.